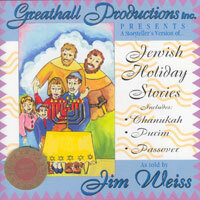 Jim Weiss' storytelling recordings have received the highgest awards from the Parent's Choice foundation, Oppenheim Toy Portfolio, Storytelling World, The Film Advisory Board, AudioFile, NAPPA, and The American Library Association, and have been widely praised in major publications across North America and internationally. He has captivated and delighted child and adult audiences with his original stories and retellings of ancient and modern classics. The three astonishing stories on this recording form the basis for three Jewish Holidays: Chanukah, Purim, and Passover.